The winding road to Hana sits mostly on the edge of cliffs represents our path in life. The winding road to Hana sits mostly on the edge of cliffs represents our path in life. Most of the decisions we make in life are not straight forward or easy. However, we have to keep going in order to reach our goals and dreams. This aerial photo of Hana Road gives us a glimpse of God’s perspective in our life. This artwork also represents that everyone must travel this road with all of its challenges; therefore no one is traveling this road alone. Everyone faces challenges. 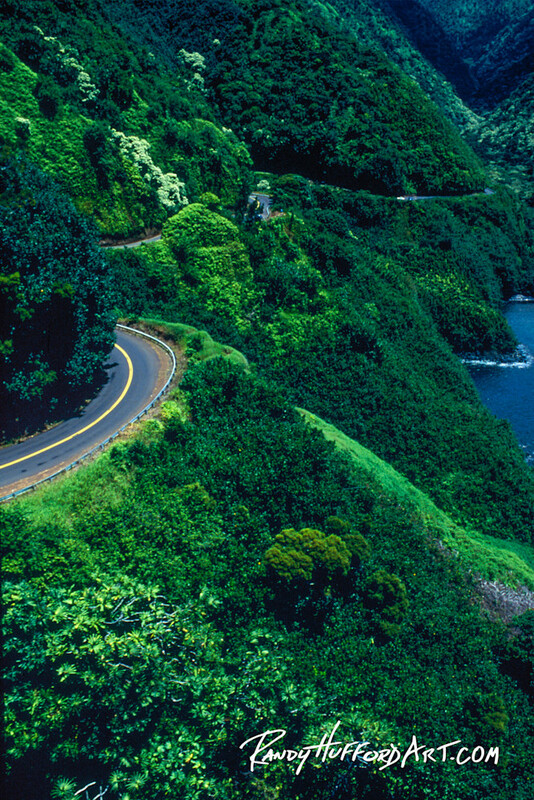 This winding road to Hana involves going about 52 miles (84km) from Kahului. However, it takes around two and a half hours to travel these 52 miles. That is if you do not have to make any stops along this winding, narrow highway and if you don’t meet anyone on one of the 46 one lane bridges you must cross.